Beef Rendang has a unique flavour, and by varying the amounts of sugar and chilies a whole range of effects can be produced. Serve Beef Rendang over rice. Beef Rendang or Malay Spiced Coconut Beef – Hot, dry spiced dish of tenderly simmered meat offers the typical Singapore/Malaysian taste of coconut, balanced with robust, tangy spices. 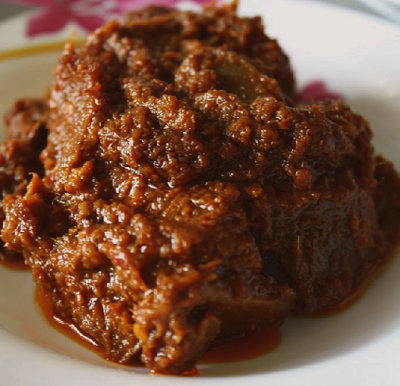 Rendang is a must-have on special occasions such as weddings, ideally served with nasi kunyit [turmeric rice]. During Ramadan & Eid, the Malay New Year, Rendang is sure to take center stage on bountiful tables of feast in homes everywhere. During this festive season, a special rice cake called Lemang is made to eat with Rendang. Lemang is made from glutinous rice and santan [coconut milk], carefully packed into bamboo poles lined with banana leaves and cooked in the traditionally way over low open fires. Using a blender, blend the shallots, garlic, chilies, ginger, and lemon grass to a thick paste. Thank you for the kind words Zonia, I am always glad to share. I think this is a very good rendang. i will try the other rendang version of yours soon – rendang padang. Thanks for sharing, you’re fantastic ! !